That's Helene at the plate. Unknown who's on first. Bag steps up to bat and knocks a double. In or over the trees was a homerun. 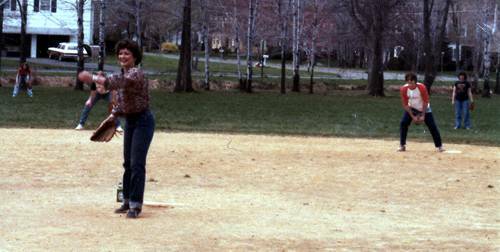 Mark Trent was the only one who ever hit a homerun into Crawzyck's yard (white house in photo). That's Odge in left with Bummer and Bag in the infield. Harry climbed up on the backstop to take photo. Jack Bobeng and Bag take batting practice. On our way to a Yankees night game. (Or it could have been a Mets game at Shea Stadium. Either way, both stadiums were gone by 2009). Baseball Notes: In 1978, Ron Guidry posted a career year, one of the best in the modern era. Against the California Angels on June 17, he struck out a Yankee-record 18 batters. Guidry's 18-strikeout performance is usually cited as the launching pad of the Yankee Stadium tradition of fans standing and clapping for a strikeout with two strikes on the opposing batter. For the season, Guidry went 25-3, with a .889 winning percentage that is among the top 10 in baseball history. Matt and Harry were among the Crew members who saw this game. Can't remember who else was there.